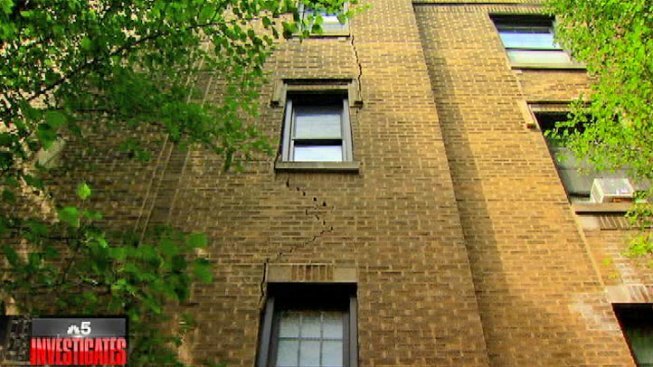 A three-story high exterior wall crack on a Roscoe Village apartment complex is forcing the city to take action against the property following inquiries by NBC5 Investigates and a concerned tenant. A renter notified the city's Department of Buildings to express concerns that a protective canopy was not in place at the building, at 2348 W. Addison St., to protect residents from potential falling debris. The crack runs above an entryway used by residents of the building. "All it takes is one brick in the head and that’s it," said tenant Jim Druzik. "And that’s why I don’t understand their logic by not protecting their tenants." Cagan Management oversees the property. Druzik said he was told by a Cagan manager that the company was waiting on permits. Records show the building’s owner filed for a repair permit in May. However, a city spokesperson said no permit was filed for a canopy. Repeated calls to Cagan Management -- and to the name listed as the owner on the repair permit -- were not returned. A canopy was eventually installed after Druzik filed a building violation complaint with the city. A city inspector visited the property and described the crack as "dangerous" and "hazardous." The inspection report also calls for an investigation of the building’s foundation to find out why the building is sinking and causing structural damage. "You don’t have to be a rocket scientist to know there’s a problem," Druzik said. The Metropolitan Tenants Organization often takes calls about rental repair issues. MTO executive director John Bartlett urged renters to first express concerns to their landlords in writing. He said if communicating with the landlord or property owner does not help, renters can file a complaint with the city as well as his organization. "Problems grow until they become a danger and a hazard to people’s health," Bartlett said. Chicago city code allows renters, in some instances, to pay a reduced rent until the landlord makes a repair. It also lets renters make repairs and reduce their rent at the landlord’s expense. "In really severe cases where they want to move out and it’s actually creating a danger that they could actually terminate a lease and move," said Bartlett. Druzik said the canopy is a good start. "I’m happy it’s up," Druzik said. The property is due in court September 18 to address the building violations.